DFSMSrmm from IBM® is the full function tape management system available in IBM OS/390® and IBM z/OS®. With DFSMSrmm, you can manage all types of tape media at the shelf, volume, and data set level, simplifying the tasks of your tape librarian. Are you a new DFSMSrmm user? 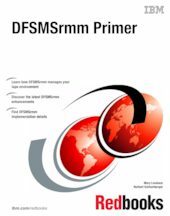 Then, this IBM Redbooks® publication introduces you to the DFSMSrmm basic concepts and functions. You learn how to manage your tape environment by implementing the DFSMSrmm management policies. Are you already using DFSMSrmm? In that case, this publication provides the most up-to-date information about the new functions and enhancements introduced with the latest release of DFSMSrmm. You will find useful information for implementing these new functions and getting more benefits from DFSMSrmm. Do you want to test DFSMSrmm functions? If you are using another tape management system and are thinking about converting to DFSMSrmm, you can start DFSMSrmm and run it in parallel with your current system for testing purposes. This book is intended to be a starting point for new professionals and a handbook for using the basic DFSMSrmm functions.